Zoom in. Descriptions of each item in the picture are below. 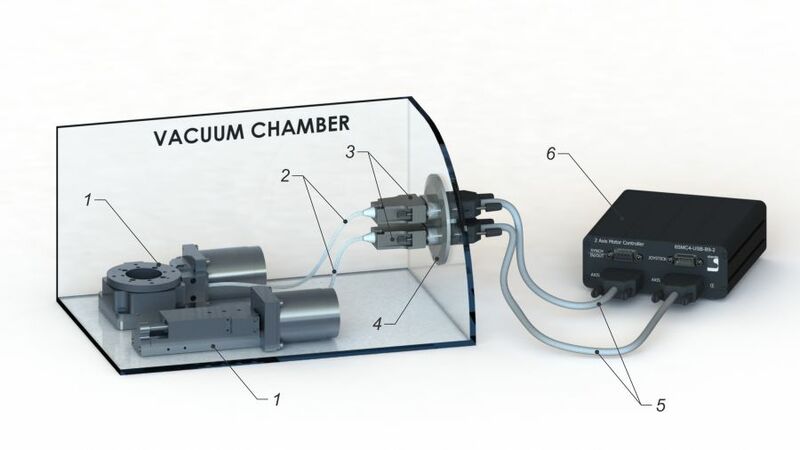 Here at Standa we have a rich experience in working with vacuum systems, designing and manufacturing vacuum-compatible devices, from motorized stages to simple manual optical mounts. In this section you will find some examples of our vacuum compatible products. If you set your eyes on a piece of hardware you would like to see in your vacuum application, but you are not sure if it can be made vacuum compatible - don't hesitate and contact us right away by email (sales@standa.lt) or phone (+37052651474). Our sales team will be happy to assist you in picking out the optimal setup. Furthermore, if you do not find an item that fits your technical requirements exactly, you are welcome to send us your required specification so we can make adjustments to our standard units or design an entirely new piece of hardware to suit your needs. All of our vacuum-compatible equipment is designed for 10-6 Torr vacuum. Products with vacuum compatible stepper motors require voltage 24V-36V. Recommended power supplies are PS24-2.5-4 (24V, 2.5A) and PS36-4.4-4 (36V, 4.15A). Majority of our motorized stages are available for vacuum. Insulation material: Kapton or TPFE. Standard length: 2 meters. By default, the cable is terminated with a temporary “test” connector which is not vacuum compatible. 3. Vacuum compatible connectors are supplied on request. 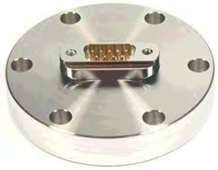 We can offer various types of vacuum compatible connectors depending on type of your vacuum feedthrough and other requirements. We have in stock 9 and 15 pin female and male Sub-D type connectors (vacuum compatible up to 10-6 mbar, body material: DEP, pin material: gold plated copper alloy, temperature range: -55°C to 110°C). Please take a look at the bottom of this page for ordering information. 4. Vacuum feedthroughs are offered on request. CF flange is standard, other types are available on request (KF, ISO, others). We have in stock 9 pin Sub-D (male) feedthrough on 40CF flange. See bottom of this page for ordering information.Custom solutions possible, see examples below. 5. Standard cables and connectors (not vacuum compatible) are used for air side connection to motor controllers or other equipment. Various connector types available on request. 6. Motor controller. You can look over our range of available motor controllers here. Other Other combinations are available.